7am, hunkered down in the back seat of Chairman Andy Buck’s space-age hybrid car, passing through the pre-dawn gloom of the Peak District, clouds murking the outline of Win Hill. A 6am breakfast settles in like the moody scenery. Northwards, like pilgrims to a magnetic hill. It could only be the journey to this year’s British Hill and Fell Relay Championships 2015. 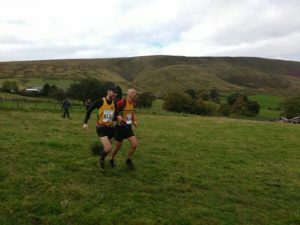 Clayton-le-Moors Harriers host this year, sectioning off most of the rural town of Barley, nestled as it is under the looming mass of Pendle Hill, site of our forthcoming trials. The main events of the day, all setting off from the start/finish area situated on Barley Hill, follows the usual format of 4 legs run in succession. Leg 1 is a solo leg of around 7K with 450m of ascent, taken on by Paul Stuart for the A (vets) team, and Tom McCart for the B team. Leg 2 is a pairs leg of 15k with 630m of climb, a tough checkpointed route for Andy Davies and Mick Timm for the As and Alasdair Menmuir and Steve Atkinson for the Bs. Leg 3 is a pairs navigation leg that offers competitors a choice of routes depending on their perceived running strengths, for Andy Buck and Ian Stinson for the As, and Phil Howson and Simon Bayliss for the Bs. The final solo leg is 8K with 400m of ascent, awaiting John Rawlinson and Sam Needham for teams A and B respectively. The prospect couldn’t be more apparently challenging, with Pendle’s massif weighing heavy in the backdrop of the teams’ camp, where spirits were running high with bacon butties all round, included in the race fuelling strategy of front-runner, and first legger, Paul Stuart. Iron guts that man, iron guts. With the Striders’ tent and flag hoisted, we had a base from which our Chairman and head honcho, Andy Buck, could corral the fell runners into action, despite the hour and the prospects ahead. Commemorative Clayton-le-Moors neck warmers were distributed. Numbers were pinned on. Camp chairs were well warmed. Slightly too expensive coffee was imbibed. A few nervous words were exchanged, or many, in Paul Stuart’s case, and not nervous enough. And before we knew it, we were off to the start of the first leg, our first leggers Paul and Tom walking merrily in the wrong direction, while the rest of the supporting team headed to the start line. Meeting up finally, the race was on, up a ludicrously steep section of road and thence track and fell. Paul came back in a remarkable 73rd place (45:15), and what would be our fastest leg of the day. Tom wasn’t far behind, only four minutes later and in 105th place (49:21), and achieving our fastest split time in the home straight sprint, completing that in 47 seconds for 41st split time place. A strong start for both. The second leg was an entirely different prospect. The runners were now a bit more spread out, and this leg called for some basic navigational skills and some serious fell-specific endurance. Andy Davies and Mick Timm got off to a strong start and toughed out an 86th place finish (1:28:53), showing off their superior endurance over the 12km distance and 2000ft-plus ascent with a remarkably consistent run. Alasdair and Steve got off to a good start but struggled in the tricky middle section with route-finding and came in at 129th place (1:44:00), despite some heroic climbing on the near-vertical ascents. 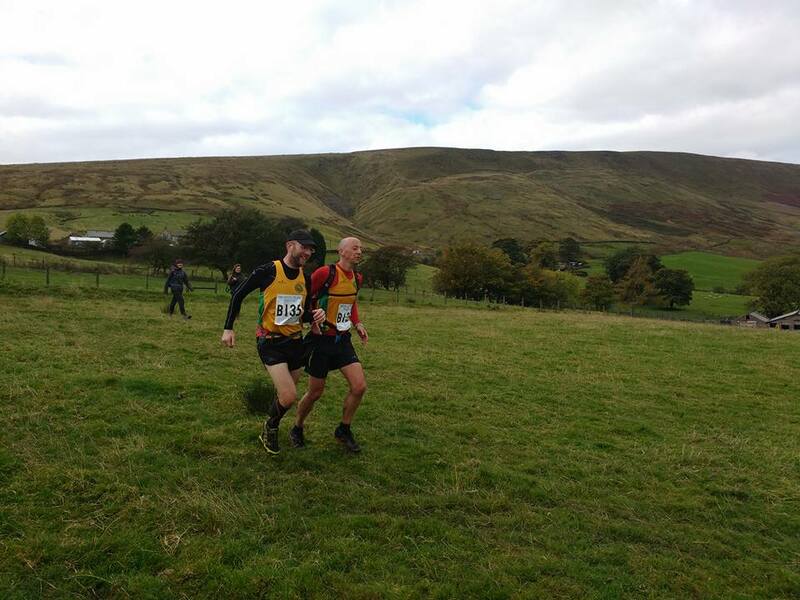 Andy Buck and Ian Stinson were dead-certs for navigation supremacy in leg 3, allowing them to show the field how the old masters get around the hills, gaining them a hard-won 91st place (1:35:48). Following close behind, yet proving that contouring is a mixed blessing, Phil Howson and Simon Bayliss made some understandable errors, especially around control points C to D, finishing in 116th place (1:48:16), with a seriously commendable upswing into control G, which gained them 80th split time place. All that was left was an 8k race up Pendle, and the devil would be in the details. John Rawlinson eked out a 117th place finish (1:01:25), later commenting that in 8k his legs felt more beaten-up than after his super-fast Chester marathon performance. Stellar substitution Sam Needham stepped up to provide team B with their highest-ranking performance of the day, with a 75th place run (52: 23). All that waiting around paid off. Done and dusted, all that remained was to trade in our meal tickets, roll up the tent and crash out into the Pendle Inn for decommissioning. In the final results, Striders V40s were 90th place, Striders open in 112th. The winners were Calder Valley men open, Borrowdale men V40 (13th overall), Ambleside women open (48th overall) and Dark Peak women V40 (65th overall). 142 teams finished, of 147 that started. As with the cross country showings, ongoing, there were some seriously good, strong, fast, runners out there on the day. And we’ll surely be back, faster, stronger, and no less determined, next year.